Stamford manager Graham Drury hit the headlines after his side’s 3-2 win over Wrexham in the FA Cup Fourth Qualifying round replay, when he said he wanted to go far enough in the FA Cup to be able to take his side to the USA with their winnings. After the 3-0 defeat on Sunday away to Hartlepool in the First Round proper of the competition he admitted that dream was over as well as the club’s fairy tale run, which has seen them play eight games to reach this stage of the competition. The furthest the club has ever been. Drury said: “It was a bit of a joke really. If we won the FA Cup I might be able to afford to take them to America. Despite the result Drury said he was very happy with his side’s preparation for one of the biggest matches in Stamford’s history. Stamford travelled up in relative luxury, using the coach normally used by Peterborough United and trained at Barclay’s Premiership side Middlesbrough’s training ground on Saturday. Drury said: “We did everything right in the evening, we did everything right in the morning. And the lads were relaxed, we were having some good banter, and I think that showed in how well we played in the first half. “I think when we got the ball we tried to use it, and we wanted to play on the counter and we did that and we created four chances in the last 15 minutes of the first half. 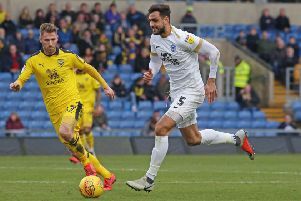 Addressing the fact he chose to play a defender up front again, as he did at home against Wrexham with Tom Batchelor in the fourth qualifying round, and then in the final moment’s of their replay win as well with Kern Miller, Drury said: “We had a game plan. Kern [Miller] did it at Wrexham and did it really well for us. I was looking for second phase play, to pick up and drive at them and first half I think it worked quite well. “Kern’s had a great effort, Sam Hill’s had a great effort, Jev’s [Brown] had an effort and Del (Gordon] has had the header. The deadlock was broken in the 65th minute through a Nicky Deverdics free kick. Drury said: “When that goal went in you could just see that they picked up, they had that belief. “I thought we kept them relatively quiet for a good 60 minutes before that. “It was a great free kick, but we gave away a couple of free kicks away in and around that area. Give free kicks away to quality like that and they are going to hurt you at some point. Gordon scored an own goal in the 82nd minute after a powerful shot from Jordan Richards deflected off him and then Billy Paynter added a third for the hosts five minutes from time. Stamford host Loughboruogh Dynamo on Wednesday night in the Evo-Stik NPL First Division South at the Zeeco Stadium. Kick-off is 7.45pm.